You can have your campaign online in a few minutes. Write down your copy. Add pictures, videos and any kind of document you need to enrich your story. Send emails to your different audiences to let them know about your news. Check your results, test and improve! 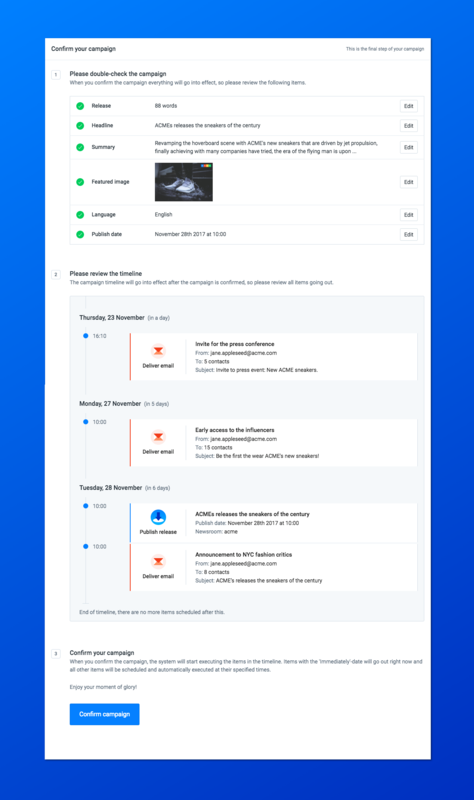 Start from the Overview page of your newsroom. See the green button on the top right? Click on that to begin your journey with our newly updated Freeform Editor. You decide where exactly you want your images, your text, your quotes and your videos. You build your media-rich narration, block by block. 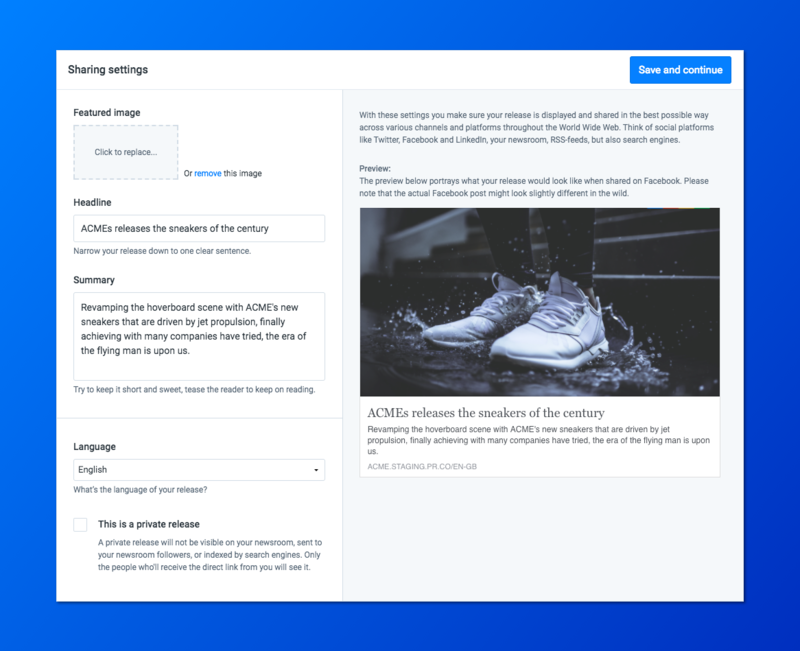 In your campaign you can create blocks of different media content and assemble them in the right order to tell your story in the most impactful way. The main types of content are: Header, Text, Link, Quote, Media and Spokespeople. Of course you can check at any time what this will look like on your live page. At first, you need to Save & exit with the blue button on the upper right. 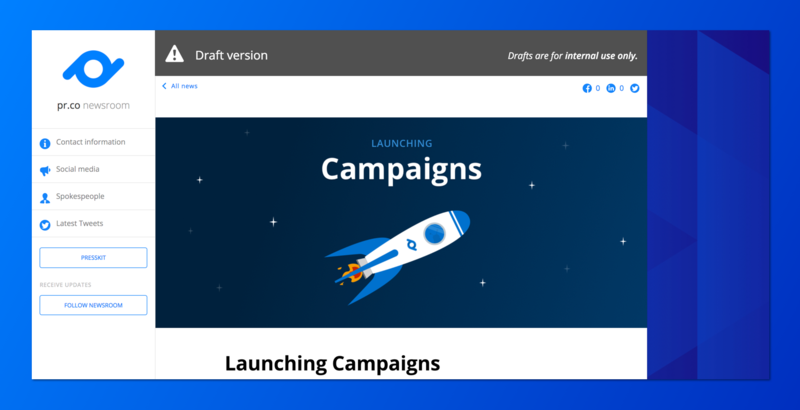 After you have saved, you can preview the campaign using the View (draft link) button. Make sure to click on this button every time you want to see the last update you've done, so the internal cache will be cleared. Looks good, uh?! When do you want to publish? In the Settings step you can set up all the collateral information about your campaign. The Title, Summary and Featured Image will appear in your newsroom. 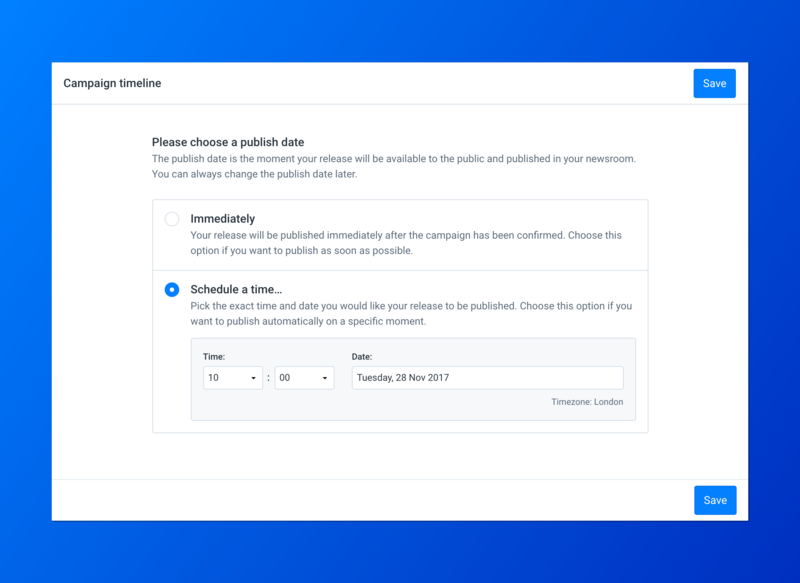 Next, pay attention to the Publish date: if you choose to Schedule a time for it to be published, pr.co will automatically publish your message on the chosen time. 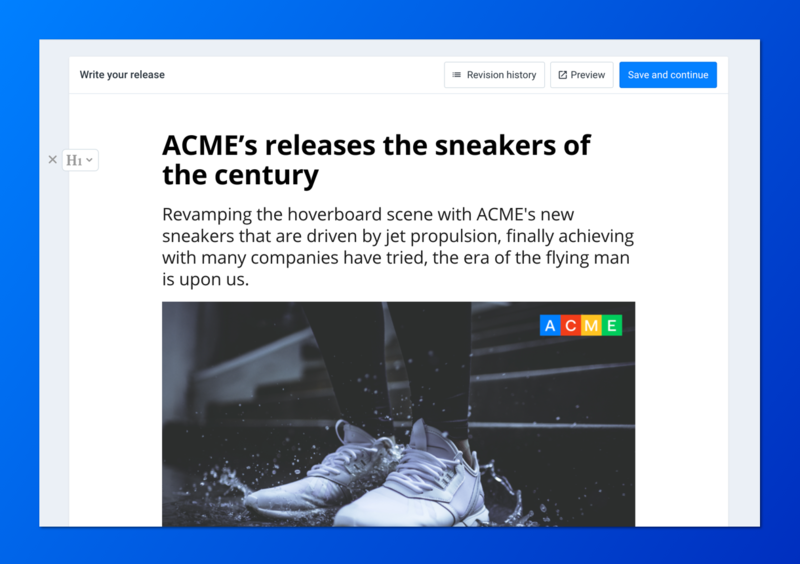 Before it's published, your message will be under embargo, meaning people can only have access if you share a private link with them. If you select Immediately, the content will be published once you confirm your campaign. Your work is not over yet. First, you need to have the right people look at your content! So put some thought into this: who is this news for? While you were writing down your news, who was the audience? Who are you going to contact, and why? Here you could either upload your own list of contacts or just start by adding a few email addresses. You could start with email addresses from friends and colleagues. Careful: if you send an email from and to the same email address, it will probably get stuck in the spam filter of your mail server. #MoreProTips: How do I import and manage presslists? You could just write an impersonal email and send it to all your contacts, but your results would be poor. Why should the receivers spend time to understand what's in it for them, if you don't make it clear from the beginning? Custom emails always have better results: divide your contacts into small groups and write down for each of them why your news is relevant. The more information you added about your contacts, the more specific you can be in your email. 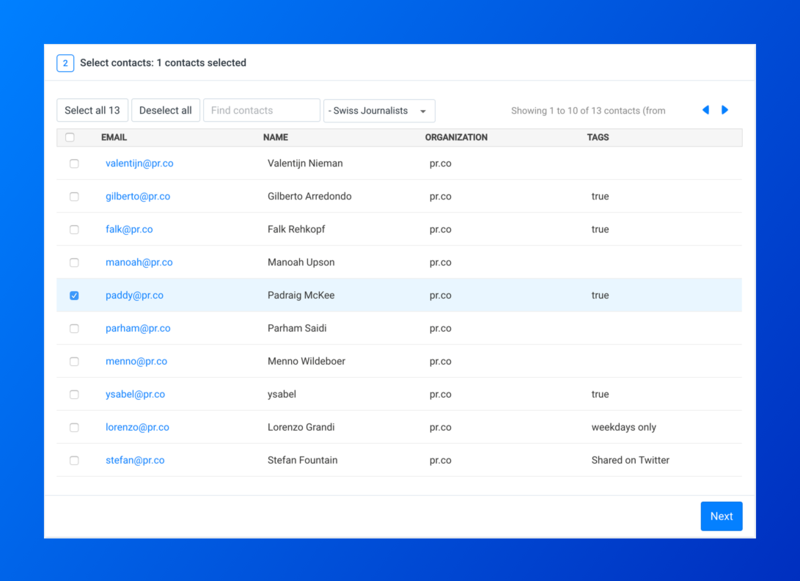 Use tags to show parts of your news and to make your email as custom as possible. Have you included the first name of your contacts? You can use it at the beginning. If it's a formal relationship, you could go for salutation and surname instead. 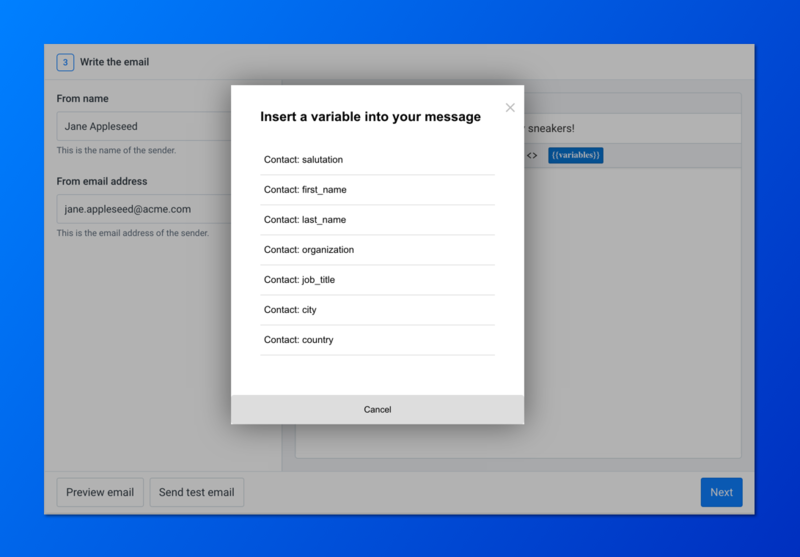 Once you've added your email distribution to the timeline you're ready to go on and confirm your campaign! Once you've added your distributions to the timeline, you're on your way to ready, set, confirm! Ok, now you can sit down and relax! Be back soon to check the results of your first campaign. How many people opened your email? How many clicked on the link to your news? These results can tell you a lot about your approach and workflow. Always be testing and experimenting to improve your results!